Biometrics represent their subjects in highly discriminatory and dehumanizing ways. The aesthetic outcomes of biometrics, the reductive subjectivities they produce, and the various problematics they raise in terms of racism, surveillance and control have been widely discussed within the humanities. 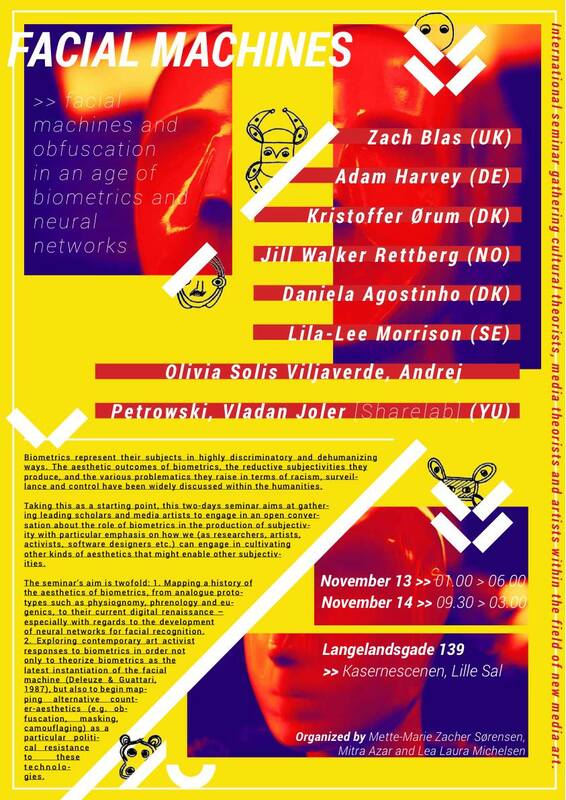 Taking this as a starting point, this two days seminar aims at gathering leading scholars and media artists to engage in an open conversation about the role of biometrics in the production of subjectivity with particular emphasis on how we (as researchers, artists, activists, software designers etc.) can engage in cultivating other kinds of aesthetics that might enable other subjectivities. The seminar’s aim is twofold: 1. Mapping a history of the aesthetics of biometrics, from analogue prototypes such as physiognomy, phrenology and eugenics, to their current digital renaissance – especially with regards to the development of neural networks for facial recognition. 2. Exploring contemporary art activist responses to biometrics in order not only to theorize biometrics as the latest instantiation of the facial machine (Deleuze & Guattari, 1987), but also to begin mapping alternative counter-aesthetics (e.g. obfuscation, masking, camouflaging) as a particular political resistance to these technologies. The seminar gathers media theorists and art activist media scholars within the field of new media and new media art.